Severus Snape / The Half-Blood Prince. . HD Wallpaper and background images in the Severus Snape club tagged: severus snape alan rickman harry potter half-blood prince potions master proffesor. This Severus Snape wallpaper contains business suit. There might also be well dressed person, suit, pants suit, and pantsuit. 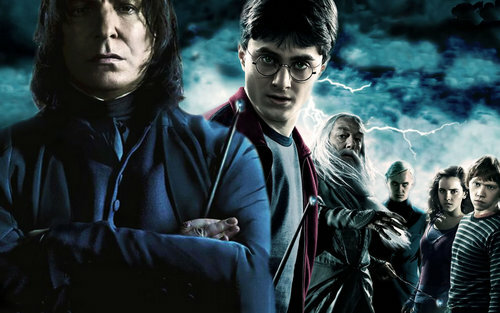 Very good pic... For me it shows that Snape is a much more important character than it looks sometimes (because of his short appearance on screen). So give him more time on screen!!! Why do they have those funny little blobs on the end of their wands? ?